Many people are choosing to buy land and build homes in Western North Carolina. Whether this is being done to escape to the privacy the mountains have to offer or as a real estate investment, buyers can’t go wrong. 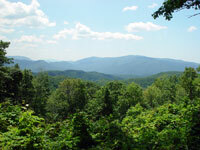 There is a wide variety of North Carolina mountain land for sale in the area. Laurelmor and Leatherwood Mountains are popular communities in the area. Laurelmor is a new mountain golf community that promotes luxurious living with beautiful, long-range mountain views. Leatherwood Mountains is an adjacent equestrian community with both lots and resort homes available. Many people are looking to relocate to the mountains of Western North Carolina to escape from the busy life of the cities and get back to nature. The real estate in this area offers long range views and properties located on rivers or creeks, providing the perfect escape to the mountains. In Ashe County, real estate along the New River is ideal for the privacy, the activities, and the beauty that embodies the escape of a mountain getaway home. Real estate in the Appalachian Mountain region of Western North Carolina offers rich panoramic views from atop the Blue Ridge Mountains or down in the foothills and valleys as far as the eye can see.